Home Discussions HPG attaching a 7x10 vanquest ifak to a ute? attaching a 7x10 vanquest ifak to a ute? looking to possibly using a 7x10 as an expanded ifak for sar; has anyone tried docking this to their ute with grimlocks for rapid release? Re: attaching a 7x10 vanquest ifak to a ute? Hi George, A 7X10 Vanquest IFAK, I have not seen one, but they look cool. I Googled it. Looks very organized and useful, like someone designed it on purpose. Do you as a practice remove your IFAK from your pack? I only ask that question because I have a UTE and Pals Pocket docked together, and I use the Pals Pocket as my IFAK. 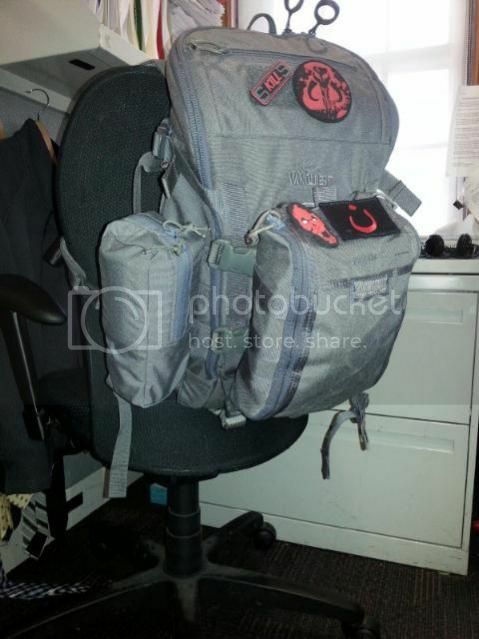 This is my SAR pack, I'm a NOLS trained Wilderness EMT. I've never removed the Pals Pocket from the UTE, and I find it works great. Maybe you could attach the Vanquest on your UTE and see if you would need to remove it for PT care. You can use split bar hardware on the IFAK molle or side molle where the shears go to mate with the compress straps on the UTE. I ran the large Vanquest IFAK like this on the outside of my Tara for a while. sorry I had not followed up with this topic in awhile. yes, I do take it off for pt care. glad to know you are using your ute for sar.I am a retired ER nurse ,and am a sar applicant here in mendocino county ,ca. I have waffled back and forth over whether or not the ute is too big for sar, especially during a hasty search, but compressed down it is pretty compact. please let me know how you are liking this as your primary sar bag, any mods or thoughts are appreciated.